100% natural, thick juice concentrate, light yellow to amber in color with a characteristic scent and taste. Pure monk fruit juice concentrate. With no calories, it is perfect for low-carb diets, keto and paleo friendly! During the filtration process, natural sugars from the fruit - fructose and glucose, are naturally eliminated so this is classified as a zero calorie sweetener. Use a delicious monk fruit concentrate, and its pure, sweet taste is the perfect zero calorie partner for your coffee, tea or any of your favorite beverages. Just 1 squeeze sweetens like 1 teaspoon of sugar. Urban Platter Monk Juice Concentrate, 125g / 4.4oz [All Natural, Zero Calorie Sweetener, Great Taste] Monk fruit is a small, sub-tropical melon traditionally grown on steep, forested mountains. It has been harvested by Buddhist monks for use as a sweetener for nearly 800 years. Use a delicious monk fruit concentrate, and its pure, sweet taste is the perfect zero calorie partner for your coffee, tea or any of your favorite beverages. Just 1 squeeze sweetens like 1 teaspoon of sugar. Monk fruit juice concentrate, derived from the fruit of the Siraitia grosvenorii vine, is a 100% natural, thick juice concentrate, light yellow to amber in color with a characteristic scent and taste. For hundreds of years, people in Asia have used monk fruit juice and monk fruit extract (also in our product line) as a sweetener and for the high antioxidant levels. During the filtration process, natural sugars from the fruit: fructose and glucose, are naturally eliminated so this is classified as a zero calorie sweetener. 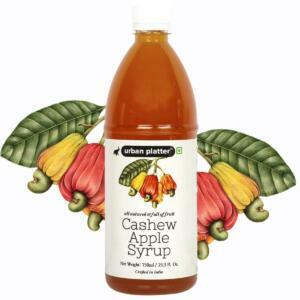 This 100% natural monk fruit juice concentrate is approximately 15-20 times sweeter than sugar and can be used for flavoring and as an alternative sweetener.